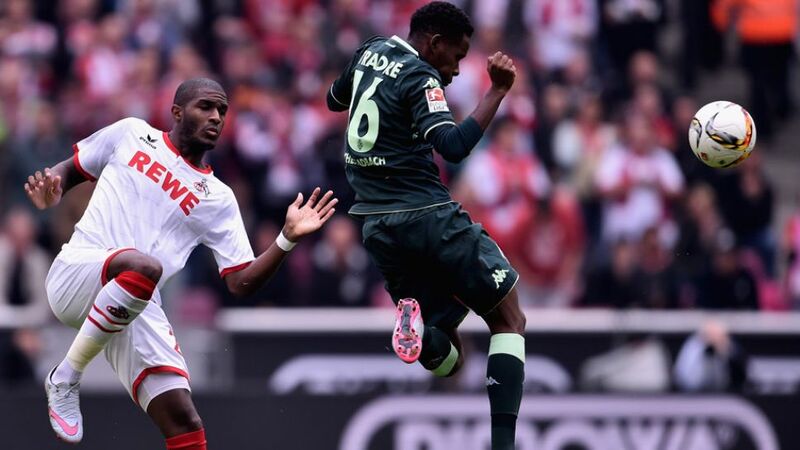 Cologne - Anthony Modeste scored the only goal as 1. FC Köln extended Borussia Mönchengladbach's losing run to five matches with a 1-0 victory over their bitter rivals at the RheinEnergieStadion. Anthony Modeste: "It's a very big rivalry. It was important to get the three points after last week's defeat [to Eintracht Frankfurt] and ahead of the midweek match [away to Hertha Berlin]. Marcel Risse: "Everyone in the city was waiting for us to finally beat Gladbach in the league. It wasn't the best spectacle, but the most important thing was that we got the three points. Granit Xhaka: "It's very disappointing to end up on the losing side. In my opinion we didn't play particularly badly. We passed the ball reasonably well up until the penalty area, but we lacked the precision needed to create enough clear-cut chances. To concede such an easy goal - we simply can't afford to do that. We're stuck in a rut at the moment and we need to work even harder to make sure we get out of it. I'm convinced we'll manage it as a team." Tony Jantschke: "It's clear that nobody can expect us to play wonderful football at the moment, but even so we didn't create enough chances to win the game today. A 0-0 would have been a completely fair result. Defensively we didn't concede as many chances as we have been doing, but once again we lost our focus and were punished for it. I'm not sure how we can get out of this difficult situation. We're rock bottom and it's up to us to get back up as quickly as we can. We desperately need a positive result against Augsburg on Wednesday." Ibrahima Traore: "We're short on confidence at the moment. We were in control of the game for long periods, but we're just not creating chances at the moment, which makes it difficult to score a goal! Köln took the lead with their first real chance of the game. That's our biggest problem at the moment. We've fallen 1-0 behind in every match we've played so far. Then we start to rush things and stop attacking in a controlled manner. We can't afford to give up, though - we need to fight back. We're playing at home against Augsburg in four days and we need to pick up points in that one, by any means necessary."